Grenada is an increasingly popular cruise destination. Located in the southeast Caribbean, it has not been as developed as some of the better known cruise ports further north. Still, it has some beautiful beaches and the lush interior will please hikers and nature lovers. At the outset, it is important to get the name right. Although the name derives from that of the Spanish city of Granada, it is not pronounced the same way. The island's name is pronounced Gren-nay-da. Geographically, Grenada lies at the southern tip of the Grenadines, south of Trinidad and Tabago and 100 miles north of Venezuela. The island is of volcanic origin and thus somewhat mountainous. Its interior is a rain forest. The nation of Grenada consists of the islands of Grenada, Carriacou and Petite Martinique. 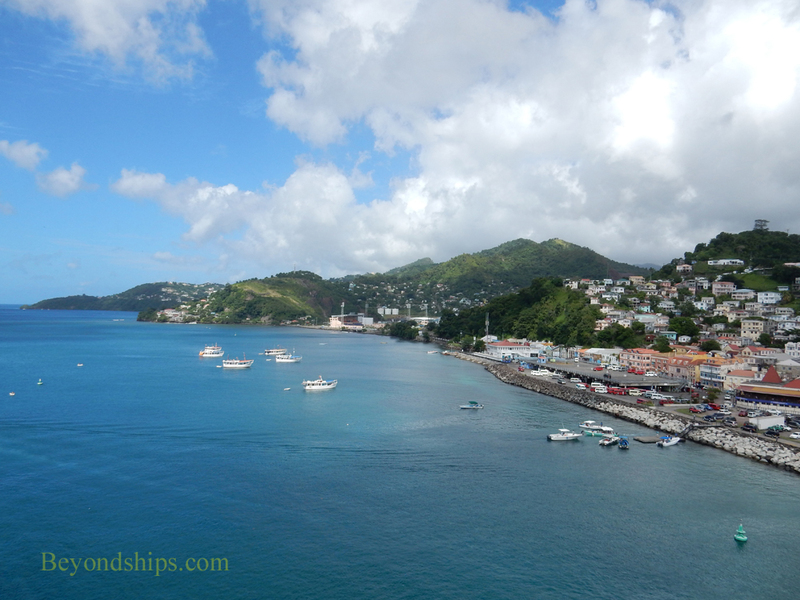 Ferries run from the capital city of St. George on Grenada to the other islands. An independent nation, Grenada is part of the Commonwealth of Nations. As such, the head of state is Queen Elizabeth II, who is represented by a governor-general. However, the real political power is held by Grenada's elected officials. It is a parliamentary democracy with a Senate and House of Representatives. Tourism has become Grenada's most important industry. However, the Island of Spice is also a leading producer of nutmeg and mace. Grenada has a unique culture. It was once a French colony and later an English colony. 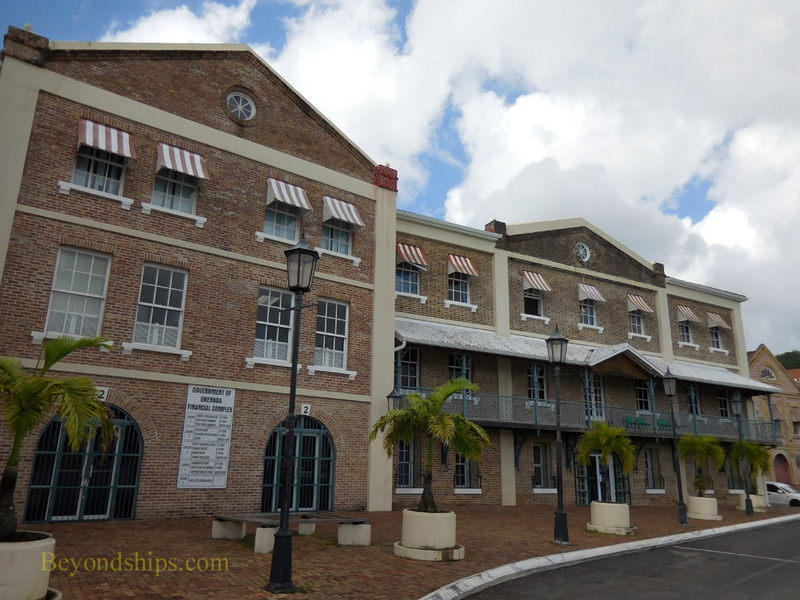 During those times, enslaved people from Africa were brought to work on the islands. As a result, the local culture is a mixture of the island's French, English and African heritages. The people are friendly to visitors. However, vendors may come across as more aggressive than in North America or Europe. English is the official language in Grenada, but many people also speak French-African patios. Grenada is not a shopping port on the level of St. Thomas or St. Maartin. However, there are tourist-oriented shops in the Esplanade Shopping Mall, which is attached to the cruise terminal. There are also local shops. The official currency is the Eastern Caribbean Dollar, which is linked to the U.S. Dollar. However, it is not linked one for one. A bank in Grenada will give you 2.67 Eastern Caribbean Dollars for each U.S. Dollar. Major credit cards are accepted by some businesses such as hotels and car rentals. Above: Govrennment buildings in St. George. 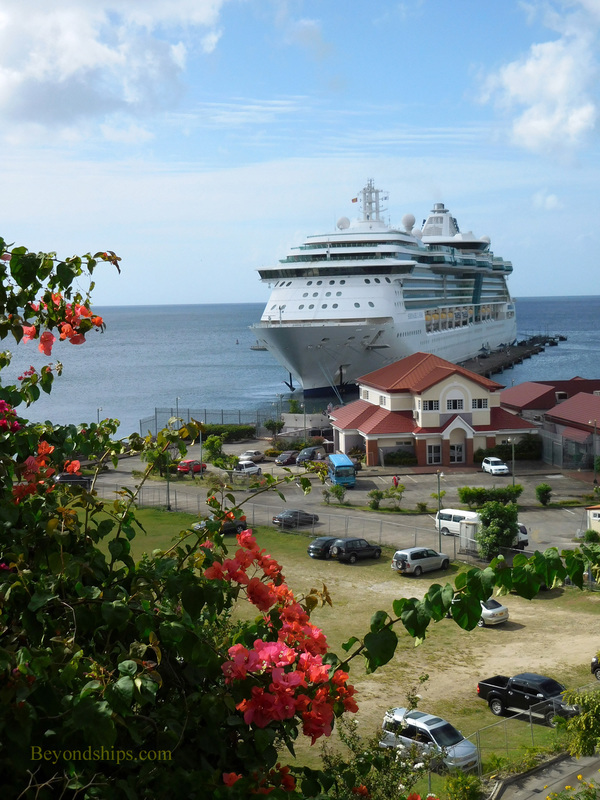 Below: Serenade of the Seas at the cruise ship pier in Grenada.